(2013). The Effect of Hydrophobicity and Hydrophilicity of Gold Nanoparticle on Proteins Structure and Function. International Journal of Bio-Inorganic Hybrid Nanomaterials, 2(3), 465-470.
. "The Effect of Hydrophobicity and Hydrophilicity of Gold Nanoparticle on Proteins Structure and Function". 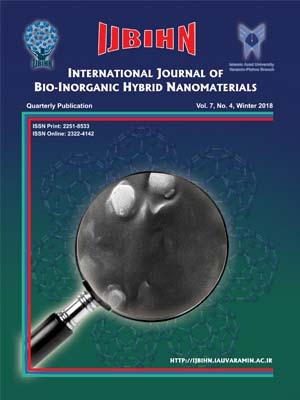 International Journal of Bio-Inorganic Hybrid Nanomaterials, 2, 3, 2013, 465-470. (2013). 'The Effect of Hydrophobicity and Hydrophilicity of Gold Nanoparticle on Proteins Structure and Function', International Journal of Bio-Inorganic Hybrid Nanomaterials, 2(3), pp. 465-470. The Effect of Hydrophobicity and Hydrophilicity of Gold Nanoparticle on Proteins Structure and Function. International Journal of Bio-Inorganic Hybrid Nanomaterials, 2013; 2(3): 465-470. The surface parameter of nanoparticles such as hydrophobicity and a hydrophilicity on protein structure and function is very important. In this study, conformational changes of glucose oxidase (GOx) in the mercaptopurine: GNPs and 11-mercaptoundecanoic acid: GNPs as a hydrophobic and a hydrophilic GNPs surface was investigated by various spectroscopic techniques, including: UV-Vis absorption, fluorescence and circular dichroism (CD) spectroscopies. Moreover, the fluorescence quenching constant and binding parameters after the formation of the GOx: GNPs conjugates follows by Stern-Volmer (S-V) plots. Size of GNPs was determined by Zeta Sizer, which their size is 80 nm. CD and florescence spectroscopy show that the conformational changes in both the secondary and the tertiary structure levels of GOx in conjugate with hydrophobic and hydrophilic-GNPs was occured. Also, Stern-Volmer plots for the binding of hydrophilic-GNPs and hydrophobic-GNPs with GOx was plotted. Stern-Volmer quenching constant, binding constant and the number of binding sites of GOx: GNPs conjugates was determined.